Geo. H. Wilson is a family-owned business that evolved through hard work and dedication from the original partnership of Izant and Wilson, established in 1921. The founder, George H. Wilson, devoted all his energies towards developing a successful business with a reputation for quality work. The company has grown over the years to a point that it consistently employs over 85 employees. It prides itself on its role in the building trades and overall community. Geo. H. Wilson is the first plumbing company to become a Certified Green Business in Santa Cruz County and have repeatedly been recognized for our role as a bicycle friendly organization and supporter of a wide range of community organizations and events. Geo. H. Wilson has evolved from its roots to the present multi-dimensional mechanical construction company. Obtaining Green certification in Dec. 2005, and then recertification in June 2009, was a natural extension of practices previously in place with our operation. We recognize that resources should not be wasted and that recycling construction by-products is an important part of our company’s culture as we strive to always do the right thing. Our employees provide quality service while using proven equipment and products for improving plumbing and heating infrastructures to schools, hospitals, institutions and homes throughout the Monterey Bay area. We welcome the challenge of being a community leader with best practices and new design innovations. 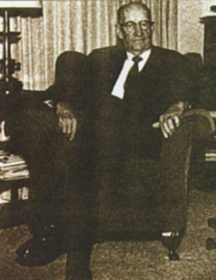 Since 1950, James E. Wilson has been working at the firm. His leadership and engineering skills are well known and respected throughout Central California. In 1984, Richard J. Wilson joined the firm. He brought a wide spectrum of engineering experience from University Mechanical in Southern California. In 1996 he became President. His stewardship has been steady throughout several business cycles. Thomas E. Wilson joined the firm as a Vice President in 1985 after a career in Radio Frequency Identification. His work at a start-up electronics company has provided a variety of experiences that have been applied to daily operations. In 2007, Julie Wilson came aboard in the Service Department. She works in dispatch and specializes in customer service. Peter H. Wilson is a member of the Board of Directors and contributes expertise in marketing and long range business planning. The Geo. H. Wilson Team is comprised of a diverse group of talented people that strive for sustainable growth through quality service and workmanship. George H. Wilson, founder, at 94. Izant and Wilson and its fleet of trucks in the early 1930s. 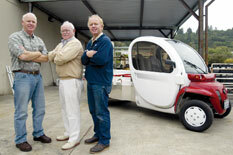 The Wilsons next to the company e-car.